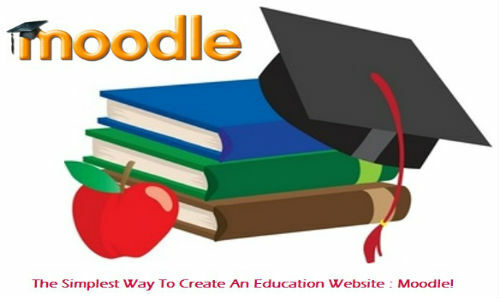 The Simplest Way To Create An Education Website : Moodle! The educational sector has also become an integral part of the online world. While the educationists might search for options to create a website for their school, college or any educational institute, it is important for all of you to know about Moodle. Moodle has simplified online education for many people. Moodle’s abbreviation is ‘Modular Object Oriented Dynamic Learning Environment’. This is a free elearning program which is also called as a learning management system or a virtual learning environment. Moodle is designed with a vision of providing the administrators, educators and learners with a secure, robust and integrated system for setting up personalized learning environments. You can easily download the Moodle software on your web hosting server, customize it and start using it. Moodle is an extremely efficient software that is proven and trusted worldwide. Currently, Moodle is powering thousands of learning environments globally. Moodle is trusted by all types of educational institutions and organizations whether they are small or big. One of the major reasons of Moodle’s popularity is that it is designed to support teaching as well as learning. Moodle has an extremely simple interface and you can setup your education or learning website within minutes. Why should you consider Moodle? Moodle simplifies the process of organizing, storing and disseminating the learning aids like video resources, text, class assignments and quizzes. You can quickly link to the online resources and upload them for the students. Once uploaded, the teaching or learning resources can be accessible to the students throughout the semester. Moodle maintains the log of all activities done on the website. As a result of this, you can track tasks, for example, you can track the completion of the course assignments. With Moodle, you can easily create online quizzes; include multiple choices, essays or short answer questions. Once the student answers a particular question, you can automatically display the right answer. One of the best features of Moodle is that it provides with online grade book. This enables the students to review their grades throughout the semester. You can find online videos on setting up a grade book and take reference from there. You can also check out Moodle related information on the official Moodle website – https://moodle.org/. Through Moodle, students can talk to each other in the online forums. Most importantly, Moodle enables you to shift the preferred teaching or learning activities to the online environments, thereby you can free the classroom time for any other activities. In short, Moodle is the best platform for organizing the teaching and learning environment. In case you are in the educational sector or if you are a student, you must upgrade yourself with the use of Moodle. If you have used Moodle, then I will be glad to know about your experiences…. Previous story How Can Web Developers Make A Disaster Recovery Plan?